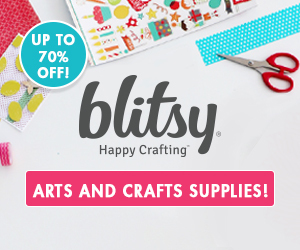 Here are today’s promo codes and coupons for our favorite craft sites: Michael’s, Jo-Ann’s, Annie’s Catalog, Blitsy, and more! There’s a couple of Clearance Sales we’ve highlighted that may be of interest. A lot of products at great prices! **Keep in mind you can only use one promo code online, however, you can use multiple coupons at Jo-Ann’s in-store. Check out their Clearance Section– there are some pretty interesting finds there! Anywhere from 20% to 70% off! Another great Clearance Section to check out! Have you joined Ebates or ShopAtHome yet? If not, you should! It’s free and you get cash back on any purchase you make with a store that belongs to either (or both). If you use Google Chrome, there’s an add-in that will then prompt you anytime you are on an Ebates or ShopAtHome supported site. I’ve noted if a store belongs to either. Promo code not working? Missing your favorite store? Let us know in the comments below. Happy Frugal Crafting!